Even by the high standards of a fine, late summer morning in New York, the weather was remarkably pleasant on Friday – not too hot or too humid and with a cloudless sky. The view from the Brooklyn Bridge as I rode down into Manhattan, the Financial District’s skyscrapers glinting in the sun, seemed calculated to convince even the most sceptical of the accuracy of New York’s claim to be the greatest city on earth. But the cyclist who followed me down off the bridge was in no mood to admire the view. As I sat towards the left of the stream of descending bike traffic, seeking a safe opportunity to pass a slower rider I’d been following, I heard a shout of “On Your Right!” Suddenly confused, I nearly clattered into the rider squeezing between me and the railings by the walkway edge. He zipped past me – at a fair rate, given my speedometer was reading 18mph – and swung into the walkway’s crowded pedestrian side to round the guy in front. Then he disappeared off down the slope. But he went on his way, I imagine, feeling a little more stressed than he’d been anticipating. “Idiot!” I shouted at him as he sped past. “You shouldn’t be…” he shouted before finishing the sentence with an angry gesture towards where I’d been sitting in the lane as I tried to pass the rider in front. It was the kind of clash I’ve experienced a disproportionate number of times over the last week, as I’ve returned to New York cycle commuting after two weeks’ vacation on Cape Cod. Time and again, I’ve encountered people who’ve been utterly determined to conserve the momentum of their car, or bicycle or walking or running body at the expense of others’ safety and convenience. All seemed caught up in the idea that the complex social activity of sharing a road or path was a private enterprise, where one needn’t take account of others. I’ve also, however, been struck by the power of fellow feeling with the road users around me to influence my own and other people’s behaviour. People caught up in the bubble of their own, desperate need to reach their meeting or soccer practice or date or whatever can transform back into normal, civil civilians the moment that they recognise how they're threatening someone else. The contrast has been so striking that I’m currently seeing nearly everything I encounter on the roads as a conflict between these two instincts – to set one’s own pace and to treat others as one would like to be treated oneself. Every journey, I’m spotting people caught up in the excitement of their own speed and a reluctance to change it. Every journey, I’m spotting how a glance into another person’s eyes brings daylight and a sense of the wider world into that tunnel vision. I’ve been reading some news items through the same prism. I was horrified by how proud a driver calling himself Afroduck was of his “achievement”of driving a circuit round Manhattan’s expressways in 24 minutes. As a Christian – and currently an adherent of a Presbyterian congregation – I was profoundly disappointed by reports of a lobby of Free Church of Scotland ministers to the Scottish government on widening of the A9 road serving some of the Free Church’s highland strongholds and the installation of speed cameras on the road. "Frustration" with slow cars caused more accidents than fast ones, claimed Rev Colin Macleod, who I fear didn’t ask himself how Jesus would drive a car. "Speed cameras... will lead to more frustration, more accidents and more funerals," Rev Macleod told The Scotsman. However, it was an incident the night before that close Brooklyn Bridge pass that made clear to me the tension between the two tendencies. As I rode up Warren St in TriBeCa, I saw a BMW trying to cut across my path by pulling across the cycle lane at an intersection and into the stream of cars. As I arrived at the traffic lights, I pulled firmly into the driver’s path, looked down towards his open window, signalled to him to stop and said, “Please wait.” Somewhat to my surprise, he did. desire to conserve momentum as bad overtaking. But, after he passed me and we carried on down the street towards City Hall, I noticed another cyclist riding into a temporarily narrowed section of road by some road works. Unconstrained by any personal interaction, the BMW driver barged past him in the narrow section. The rider’s arms flew up in exasperation and fear as the driver passed him with inches to spare. It was only the rider’s quick reactions that prevented his being battered into the concrete barriers, with potentially serious consequences. It’s hardly surprising, however, that so many road users are so keen to conserve their momentum. It’s one of the great joys of piloting any vehicle – a car or especially a bicycle – to feel one’s moving at speed without having to make an effort. It’s no coincidence that I regularly hear businessmen speaking in the wooden-tongued jargon of contemporary American business describing their company as having “momentum”. It’s what political campaigns seek too. There’s a pleasure in that feeling of being carried along by the effort one’s already made, or by gravity or the wind that adds up to far more than merely the product of one’s mass multiplied by one’s velocity. 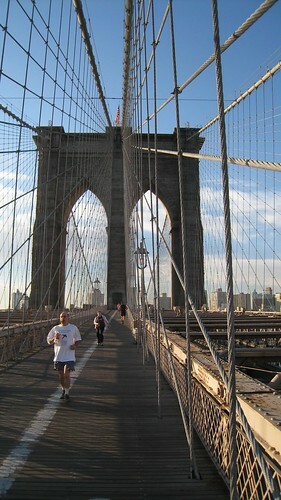 I’ve described myself the pleasure of a downhill run on one of New York’s East River bridges when clear of obstructions. The desire to maintain one’s momentum comes, I suspect, from some of the deepest, most primitive bits of the brain, which house our deepest joys and fears. There’s a serious discipline, meanwhile, involved in applying one’s brakes to suit another person. All the pleasures of feeling that onward progress disappear. It’s an effort to get going again. As the story of the barging bicyclist of the Brooklyn Bridge shows, it’s a discipline that cyclists often struggle to exercise. Yet, of course, the danger from people driving motor cars is all the greater. Someone shut inside a metal box is apt to be insulated – as Afroduck seemingly was – from the sheer danger that his or her speed represents to others. Drivers are consequently likely to behave more dangerously. how conscious are the drivers of each others' humanity? There is, nevertheless, joy in exercising that discipline. I’ve been trying especially hard since realising how much I enjoy my own momentum to stop for pedestrian crosswalks even when most other cyclists don’t. The tense faces of people glancing up and down the Hudson Greenway waiting for a gap in the bike traffic melt into a smile when they realise someone’s halted for them. There’s an inner satisfaction from knowing that one isn’t going to pass another cyclist before there’s enough, safe room for it and that one’s unlikely consequently to scare the other rider. I’ve long tried to exercise the same discipline on the rare occasions I drive a car, knowing how fearful cars can make me when they pass too fast or close. It’s a far less visceral pleasure than the rush that Afroduck would have experienced from rounding Manhattan at an average speed of 66mph. It’s the kind of behaviour that can exasperate people who feel they must get past at any cost. Freud would have said it’s an action motivated by the superego, while the pleasure of speed belongs to the id. Yet to use one’s brakes to act considerately towards others is also to recognise a profound truth about roads, cycle paths and all the other places that people use vehicles close to each other. They’re places that pitch us into some of the most complex social interactions possible. When so many people treat those places as if they were their own private domains, it’s no surprise so many of the people around them – the people whose reality they’re ignoring – end up getting killed. I've tried a few times, with little positive result, to chat with athletic cyclists about the momentum fallacy. In seeking a workout, I ask them, wouldn't it be more beneficial to come to a complete stop, and then accelerate when it's safe and legal to do so, requiring you to expend more energy while also exerting additional muscles in the process? In discussing the issues which accompany the Mad Rush approach to movement through crowds, I try pointing out that this behavior is likely to be a symptom of other, greater issues in life--being always late, making choices and setting appointments poorly without allowing adequate time, poor planning, bad execution, miscommunication about time and place, and so on. Addressing those issues such that you can overcome the Mad Rush tendency and slow down while moving through crowds improves not only your wellbeing, but also, as this blog post points out so well, the wellbeing of others. Unless they are messengers on a deadline or doctors rushing to save a life, it will pay off to slow down. From my limited exposure, a messenger squeezing past wouldn't faze me much, long as they don't touch as they pass, since their skills seem generally adequate to the task. I often think that my readiness to stop makes me fitter. In London, I used to delight in catching up with and sweeping past cyclists who'd blown through red lights while I was waiting. Unfortunately, in New York, because there are so many more lights, the benefits for red-light jumpers are greater and it's generally impossible to make up the ground while obeying the traffic signals. I have to admit, meanwhile, that, like most newspaper reporters, I am constantly in a Mad Rush. My coping technique is to put it out of my mind when it comes to red lights and other safety-critical points. If one regards a red light as an immutable signal to stop, in my experience, it becomes far easier to stop. It's also far easier to avoid scaring other road users if one simply sets a hard and fast rule that one isn't going to pass another rider on the wrong side or where there isn't space. I would argue that there is an explanation that is rather more simple. Both afroduck and your Brooklyn Bridge friend are products of the environment that we have built for their chosen mode of transport. It is absurd that there is a road environment somewhere as crowded as Manhattan island that can facilitate a 66mph circuit. And if the powers that be gave sufficient space on the bridge or elsewhere to accomodate all kinds of cyclists and in sufficient volume there wouldn't have been the conflict that you describe. It's a reasonable point. Part of the problem on the Brooklyn Bridge is undoubtedly that the pedestrian and bike area is too constricted. One day I hope they'll take away a car lane on the main bridge deck and let cyclists ride there. Cyclist numbers on the bridge would instantly soar, I predict. You might also have seen my meditation a little while ago, based on a visit home to Glasgow, on the failings of the great road-building era in both Glasgow and New York (http://invisiblevisibleman.blogspot.com/2013/06/citibikes-drivers-and-science-of-moral.html). Robert Moses, the "great builder", cut Manhattan off from its waterfront by building the expressways that Afroduck used. They are mostly elevated, which I suppose makes a difference to how much space they consume (there are cycle paths under some) but they are a blight on the city. I'm not convinced, however, that infrastructure, while important, is the only issue here. Even on far larger cycle paths or on far calmer roads, there will always be a few circumstances where people end up crowded together. Some people will always tend to behave poorly under those circumstances. The critical issue is to get more of those people recognising what their responsibilities on the roads are. Thanks for the reply - Yes I think we're pretty much in agreement on this one. Thank you for that. I did realise (I think partly because I watched one of your helmet cam videos once) that you were, like me, an exile from the Dear Green Place (lit. trans. of "Glasgow" from Gaelic, fact fans). That's why I mentioned Glasgow in the comment. On my previous post about Glasgow, I lamented Scottish transport policy at some length. My mother was telling me yesterday that she was seeing more and more people cycling in Glasgow (something she'd always insisted the weather and the handful of hills in places would prevent). But Scottish politicians remain sadly fixated on big projects, unfortunately, and don't seem to get the idea about cycling at all. I'm going to push back on this point a bit. The thoughtfulness the original post talks about should not be contingent upon things being easy. There is much room for infrastructure improvements, but there will always be moments of friction and it is on the person to decide how to handle those moments, independent of mode of transportation. Further to that point, everyone knows what the Brooklyn Bridge is like, mounting it while being unprepared to accommodate other users isn't an attitude that should just be shrugged off. If you're not ready to be thoughtful about the people around you, you're not ready to bear the responsibility of piloting a vehicle. Thanks for the comment. I essentially agree with you - but I think that the Brooklyn Bridge would be nicer to use if it weren't so stressful for everyone. The stress makes people's behaviour worse. So, yes, the guy who buzzed me should have been more considerate and been prepared to understand other people were using the bridge. But, yes, better infrastructure would help people's behaviour. Does that make sense? There's always a first time, I suppose. I guess that brings me to my point of contention. Everyone here agrees that better infrastructure is necessary, but I'm not sure that it will create better behavior unless we also begin asking that of each other. You can't blame being a jerk on the infrastructure; you were on the same bridge and demonstrated different behavior. Further, I think most people can agree that the Hudson Greenway is set up pretty well. How often have you been buzzed there? What's the excuse there? You have previously touched on the civil liberties aspects of biking. Let me tell you as an African American that there's room in the same conversation to point out and fight systemic inequality while absolutely calling for personal responsibility. Shoot, it's the default topic of Sunday sermons in AME churches all over the country. My main problem here is my personal weakness. I'm trying to agree with all my commenters. It's not as if there are that many of you. You are entirely correct. People need to behave better towards each other. That's the main point of the post. People get caught up in their own momentum and it makes them forget others. Better infrastructure, however, makes it easier for weak, fallen humanity (to borrow the kind of language you might hear down that AME church) to behave in a less fallen fashion. You're right that I'm trying to behave better in situations where others behave worse (although, full disclosure, the Invisible Visible Woman has questioned whether I stop as frequently for pedestrian crosswalks on the Hudson Greenway as I should). But even the Hudson Greenway is pretty crowded, particularly given the number of runners and other non-cyclists clogging up the path. So there are infrastructure-related stresses even there. My interest, I guess, is in what's going on in people's minds and hearts as they get about and I think people should think more logically and compassionately about it. If they did, they'd behave better. But I'm also struck by how deep-seated people's selfishness and irrationality are. So I'm keen to see changes that make that selfishness and irrationality less damaging. As of last week, I myself have a new bell and I have to say its greater audibility is making life far easier. This type of behavior where people try to preserve there momentum without regard to others goes beyond just driving or cycling. It is exhibited by people trying to accomplish pretty much any task in a busy city environment. I have seen it from walking down the street to shopping during holiday season. The city environment is very overwhelming. The human brain is not easily able to relate to so many people all at one time. To manage such a busy situation our brains categorizes other people as obstacles that slow their momentum or progress rather than people. I think that is why when you start a friendly conversation with another road user they suddenly switch to being more courteous and polite. They suddenly start seeing you as human rather than part of the noisy environment. Thanks for the comment. You're right - the issues are wider. It struck me as I was writing that people's determination to use their cellphones while driving was part of a similar "my-behaviour-patterns-can't-change-to-accommodate-other-people" phenomenon. But, while cities are challenging places to live, I'm not sure I blame it entirely on cities. When our family were on the roads (rather than bike paths) during our vacation on Cape Cod, we got buzzed closer and at higher speed than in New York City. There was a feeling, I think, that one should expect to be able to drive in the countryside without adjusting one's speed. We were an obstacle to that. To me, this suggests a biker's momentum, if disadvantaged by motorists or infrastructure, has slightly greater weight than a car's momentum. If you see what I mean. FOr me, losing momentum as a bike commuter is not something I take lightly! Although my initial example involved a selfish fellow-cyclist, I'm pretty clear, I think, that motorists' determination to maintain their own momentum is far more damaging than cyclists'. I also absolutely think it's a social justice issue that private cars are given such a disproportionate share of road space. But I still as a cyclist feel an obligation to look out for others, particularly pedestrians but also fellow cyclists, and am aware that my selfish desire to maintain my momentum can work against that. I think it's all in our personal attitudes. When I watch the bike rush hour videos from Copenhagen or Amsterdam I marvel. No one is screaming, no one is pounding on anyone's cars. True, their reported happiness quotient is much higher than ours in the US so perhaps they're just better adjusted people. But I wonder, even as I advocate in my county for more and better bike infrastructure, if that's really the fix. I suspect behavior and manners classes would be an equally good investment! If we have more bike lanes allowing more annoying jerks, we haven't really improved anything. So, trying very hard not to be one of those people. I do confess it is difficult when some clueless pedestrian steps right into my path of travel, wearing earbuds and with his/her music up so high she/he hears neither my bell or yell. I guess if Jesus rode a bicycle he'd just part the crowd -- sanctified bow wave? Funnily enough, I once reported from Copenhagen and interviewed the head of traffic policy. He told me that one did precisely see cyclists hammering on the roofs of the cars of uncooperative motorists and that he had, in the past, done so himself. It's certainly a less widespread phenomenon than in these United States - but, while the circumstances are different in different places, people worldwide exhibit similar personality flaws to each other. As for the bike infrastructure and allowing people to be jerks thing, I'm pretty clear that I'd rather someone were a jerk with a bicycle than with a car. I also think that, generally, the experience of being a vulnerable road user does make people more aware of road dangers and less inclined to behave badly. On top of that, it's pretty clear that transfers of journeys from cars to bikes make life safer for pedestrians and children and so forth. So press away for improved bike infrastructure, I say. On pedestrians, meanwhile, I had someone step out in front of me this morning from between two parked cars pushing a trolley, so I very much feel your pain. And some time I'll write a blogpost on how my religious convictions and transport use fit together. But I'm not quite ready to make an unequivocal "Jesus would be a cyclist" claim yet. 1) Fast cars often make me want to get off that stretch of road as fast as I can. 2) It seems to feel less scary if the speed differential between me and the cars is smaller. So I'm happy to think of your cruising in a more relaxed fashion around your little corner of Washington State, giving the occasional stop sign the Idaho treatment.